The wedding of a best friend is probably one of the most memorable occasions. Among the congratulation messages the bride or the groom may receive, yours will be one of the most awaited. Most likely, as a best friend, you will be very busy helping the bride or groom prepare. Just don’t forget to also write your message. Got no more time to think about it? 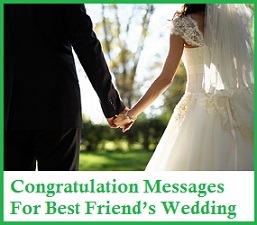 Here are some sample congratualtion messages for best freinds wedding you can start with. No two people are more deserving of happiness today than the two of you. I knew you were perfect for each other from the time you met. Congratulations on your new journey in life as a married couple. My best wishes for both of you. Congratulations on your wedding day. I hope that your love will last you a lifetime. I wish you both a happy and prosperous marriage. Congratulations, buddy! May this bond of love hold you together, my two good friends. Yours is a partnership that was meant to be from the start. Congratulations! My wish for both of you is that you continue to stay together through good times and even more during the bad times. I am happy for you. As your single lives end today, may your union be continuously filled with love and understanding. More power to both of you. Congratulations! Having two of my friends marry each other is one of the best things I can witness in my lifetime. I wish you all the best that life can bring. Congratulations! As an adventurous couple, I know that you will have many fun times ahead. Congratulations! May your life together be filled with endless adventures filled with love. May you have an amazing life together as man and wife. Congratulations! I will always remember this day as the start of my best friend’s happiest moment. I wish that this happiness you share together will keep your love strong for a lifetime. Praying for more blessings as you enter the new life as man and wife. Congratulations! Grow with each other and nurture the love as you continue to develop your own individualities to the fullest. Congratulations! You’ve finally done it! Congratulations to a very strong couple. May you continue to support each other in battles and in victories. Grow in love and strengthen each other. Congratulations on your wedding! The love you found in each other was truly meant to be shared for a lifetime. Congratulations! You wedding day is so joyful. My wish for both of you is that this happiness will stay on for many decades to come. Congratulations! You both found someone who can tolerate your personalities. It’s a match made in heaven! Congratulations! Two hearts and two minds bound by marriage and by love. May you always be ruled by love and trust as you take on this exciting journey in life together. Congratulations! Take care of each other as a lover and a friend. Keep the courtship going and you’ll never go wrong. Congratulations! If you think you had a wonderful life before, you are in for a big surprise. The next phase will be better than ever! Congratulations! You are both unstoppable in love and in meeting every challenge. You deserve each other. Congratulations! May you keep falling in love with each other. Congratulations! Previous articleHow To Use "Dell Mobile Connect" On Windows 10?